As Yemeni Houthi fighters and army troops waged gun and mortar battles near the presidential palace in Sanaa, the rebels captured the country’s state news agency and TV station. Monday marked the country's most intensive clashes since September. The clashes were focused on an area near the presidential palace and the residence of the national security chief. The diplomatic compound in southern Sanaa was also affected. It was not immediately clear whether PresidentAbd-Rabbu MansourHadi was in his residence at the time. "If the previous agreement is not honored, there is a commitment to escalate the situation...and it is difficult to undo the escalation, which will come at a big cost," he said. Government sources said on Monday evening that armed Houthi gunmen had surrounded Yemeni Prime Minister Khalid Bahah’s Republican Palace residence just hours after he escaped an assassination attempt. “The gunmen have surrounded the palace and the prime minister is inside,” Reuters cited government spokesman Rajeh Badi as saying. 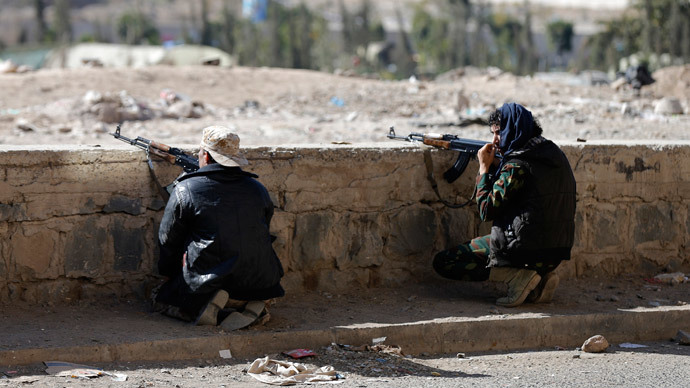 Earlier in the day, Houthi forces were said to be in talks with the president President Abd-Rabbu Mansour Hadi. “Houthis in meeting with president to agree on terms for releasing chief of staff in return for changes in constitution and national authority,” Information Minister Nadia al-Saqqaf wrote on her Twitter account.